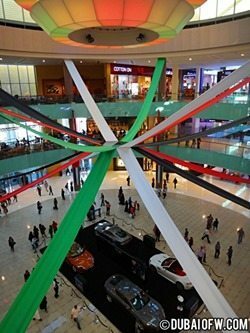 The Dubai Mall is Dubai’s premier lifestyle, shopping and entertainment location with over 1200 retail shops. It has a 21st century gold souk, 22 cinemas as well as top tourist attractions. The Dubai Mall has a Fashion Avenue area, which is an area dedicated for luxury leading brands as Louis Vuitton, Dior, Valentino, Chanel, and Hermes. You should check it out when you drop by this avenue to get a feel of luxury shopping. This center is not only for shopping, as there’s a range of things to do for the more adventurous person. With adventure sports and an indoor ice-skating rink available, Kidzania where children can act like adults in a simulated work set-up, a SEGA indoor theme-park, Dubai Aquarium and Underwater Zoo – all of these can be found in this great shopping mall in the UAE.